You are just in time for the annual race of the famous jumping frogs of the Kernouille marsh. The first player who manages to get his frog team across the swamp wins the game. Not knowing how to swim, these famous frogs have to jump from water lilies to water lilies to cross the swamp. Attention! The marsh is coveted. It is up to you to place your water lilies in order to organize the crossing. Now the race is about to start! 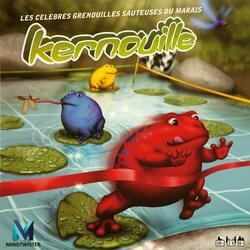 Kernouille is fast, fun and strategic. A game for the whole family.